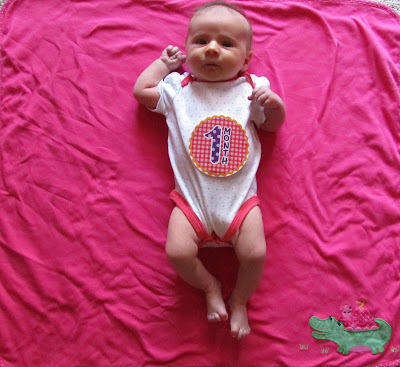 My little girl is 1 month old! I can't believe how time flies. I weighed Mira yesterday and she is 10 pounds. Our little punkin is in the double digits now. She's even growing out of most of her newborn size clothes, sad. I know they said the emotions get worse for the first couple weeks after you have a baby, but I didn't think it would happen to me. Luckily I didn't have post partum depression, but I did get the baby blues and occasional crying (all revolving around the fact Mira was growing too fast and time went by too fast). I probably cried at least once a day because she was basically growing in front of my eyes and just thinking about how I wish I could do it all over again; the labor, the birth, the first couple days with her in the hospital. In fact, I even miss being pregnant. I'm still getting used to the fact that I no longer have a belly. It all came and went too quickly. I had also been struggling with the fact that I had a c-section. I didn't think it would be a big deal until it actually happened. I didn't get to hold my baby right away, which was obviously sad to me. Those ~2 hours I was initially separated from my baby actually kind of wounded me. Evolutionary-wise, that separation is not supposed to happen. Mothers are supposed to be able to bond with their babies right away. Once I got to hold my baby, I forgot about all the trauma. I even forgot about it all after we got to take her home. Then when I saw the pictures my dad took of Adam holding her in the nursery, I got really sad again. He was getting that initial bonding time with her while she was just about 20-30 minutes old. It was hard for me to see that. I had to wait until she was about 2 hours old. This is why I would never wish a c-section upon anyone. Not unless the hospital does things way differently, which I've never heard of. Looking back, I wish I would've spoke my mind more. It's my child, so I should've been able to hold her when I want to and for how long I want to. Even though the hospital staff was wonderful, I wish I would've been more aggressive with my wishes. On a brighter note, Mira has started smiling at us (not just in her sleep anymore) and I'm so in love. She most frequently smiles on her changing table while/after getting a dirty diaper changed. (I'd be smiling too!) She also smiles big when we give her kisses. She tries to talk to us by cooing and gurgling, which is obviously adorable. She also has a really strong neck and strong legs. She was already partially holding her neck up when she was still in the hospital, now she head butts us. Her favorite thing is being in her snugamonkey swing with the music on. She just stares at the moving monkeys that move above her head. She's most comfortable laying on mama in any position possible. The one thing Mira struggles with is burping. I've never seen a baby be such a stubborn burper before, and this causes her to be fussy later on since she gets gassy. So, basically I have push through the crying and whining and head butting and try to burp her, no matter how much she fights it. I know they say not to, but there have been a couple nights where I let her co-sleep on top of me because she was fussy. I make sure to prop pillows on the sides so she doesn't roll off. There seems to be lots of new data out there that say it's okay, in fact preferred to co-sleep with your baby in your bed. I don't want to make it a habit, though. I just bought an incline napper that fits right in her bed and so far we've had awesome luck with it. We love Mira so much and can't believe she is ours. I was just thinking today, how many nicknames Adam and I have given her. Muffin, Little one, Punkin, Sweetie, Honey bunny, the list goes on. Any cute name we can think of we will call her. Here's to another successful month full of more milestones and lots more baby smiles!